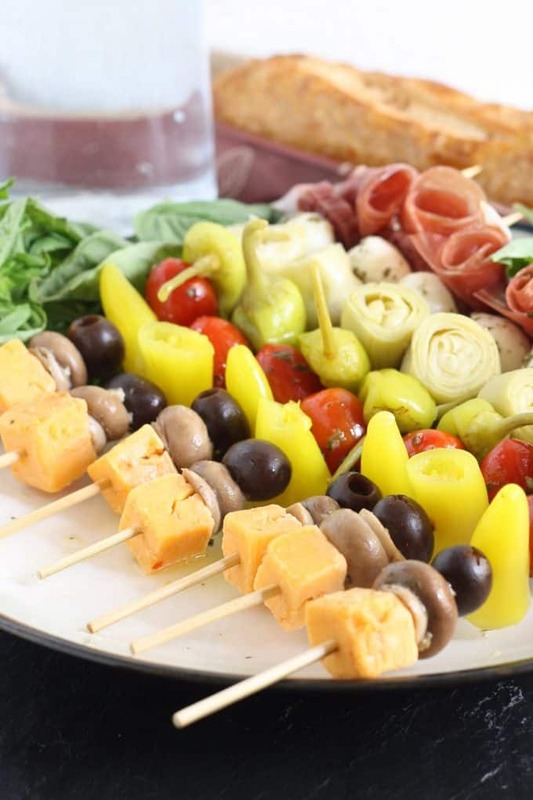 This antipasto skewers recipe is the perfect lazy day Italian appetizer. They can easily be made from store bought pickled items or from your pantry stash! Easy to eat and very delicious! 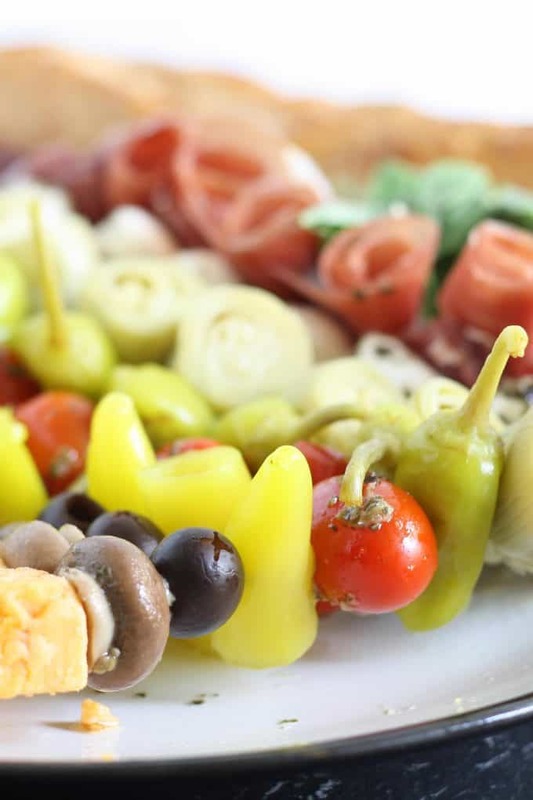 One of my favorite appetizers are these delicious antipasto skewers. They are a great way to start the party and perfect for folks that like to graze when eating. Also, they’re great for social butterflies because you can carry your whole appetizer around on a stick with you. What is better than that? I say nothing; I do love my food on a stick. Antipasto can comprise of so many different things. 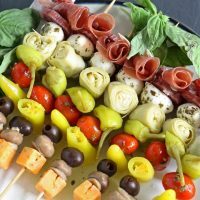 When you make these skewers, I want you to feel free to take liberties and substitute or add your favorite antipasto items. Since you usually eat each ingredient on its own, I don’t think its as important as it normally would be if the flavors go together. I included both Sweet Banana Wax Peppers and the Whole Golden Greek Peperoncini (cut in half) in my skewers. I couldn’t decide between the two so just went with both. Antipasto means before the meal in Italian and this easy recipe is the perfect Italian appetizer. I like to marinate my cherry tomatoes and fresh mozzarella in a blend of Italian spices and olive oil for about an hour before preparing my antipasto skewers. This step isn’t necessary of course, but since it doesn’t take that long, why not do it. 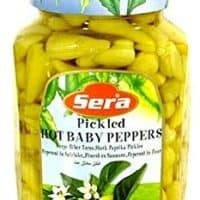 The rest of the items I chose can be found in condiment aisle – just look for all the weird pickled things and go crazy! It also occasionally includes fish if you are from a coastal region. Feel free to add or subtract for your personal taste. Looking for more food on a stick? 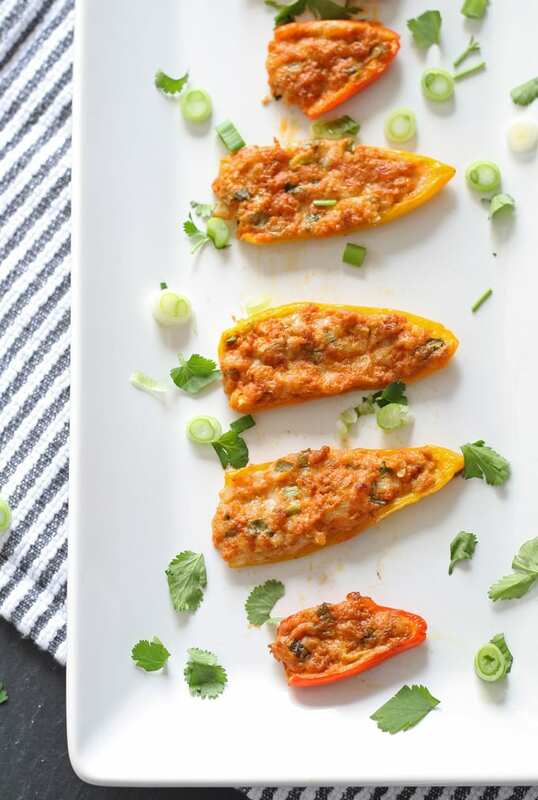 Looking for an easy party appetizers for a lazy summer day or a casual and relaxed barbecue? 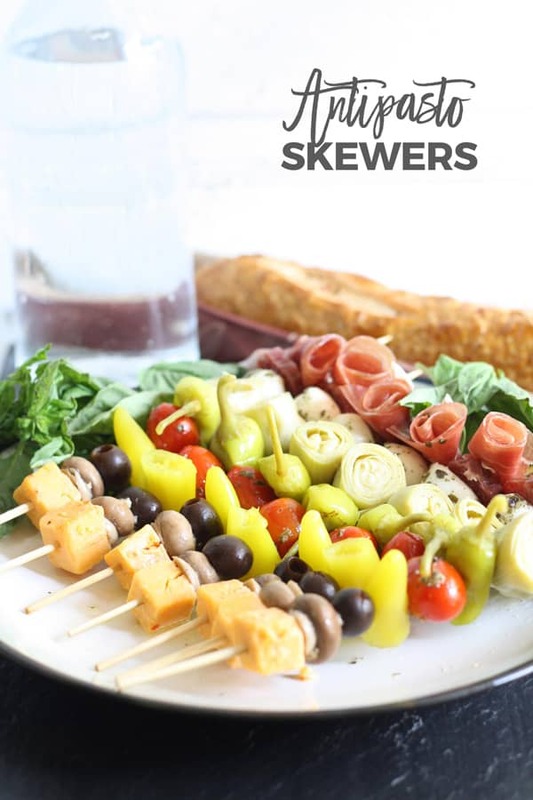 These antipasto skewers can easily be made from store bought pickled items or from your pantry stash! Easy to eat and very delicious! Take a skewer in hand. Slide one of each ingredient onto the skewer. Repeat until all skewers are full. Refrigerate until ready to serve. Looking for more appetizers and finger foods? 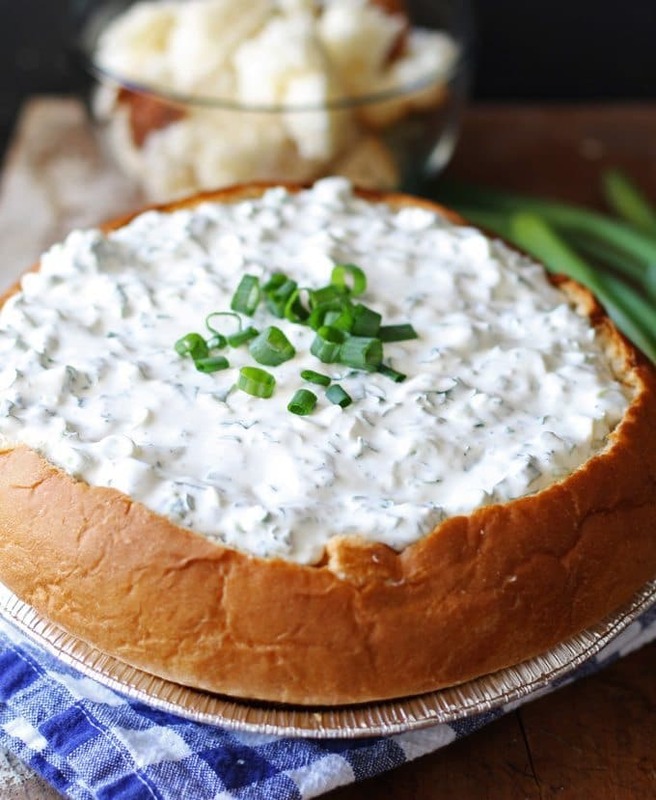 or my easy green onion dip! 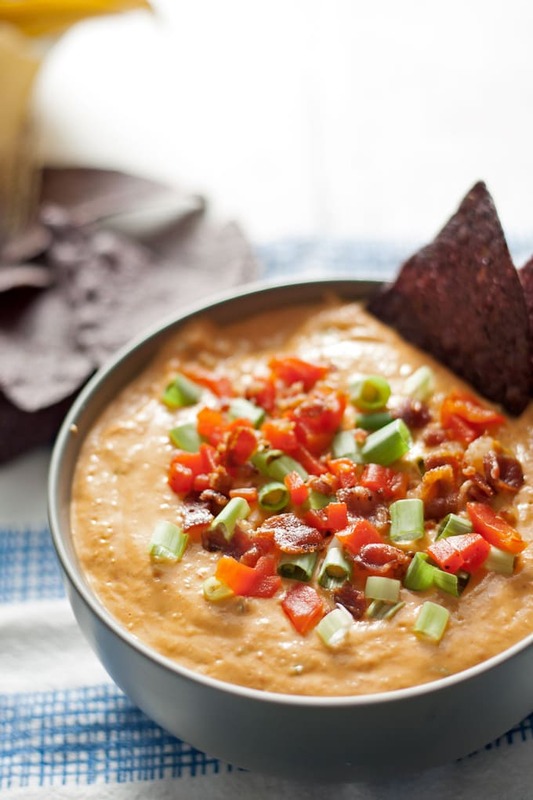 Or my hot pimento cheese dip! I always have these peppers in my fridge. They add great flavor to salads, pizzas, scrambled eggs, etc. These skewers are gorgeous! Thanks Kristen! I just love peppers! These look great, Jenny! 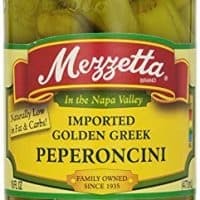 I love Mezzetta…I buy their products all the time! And antipasto is the best…I think I’ll be making these for our next party! Their products are fantastic! 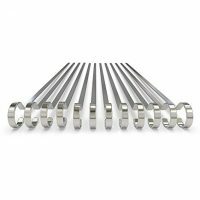 I hope your guests love the skewers! 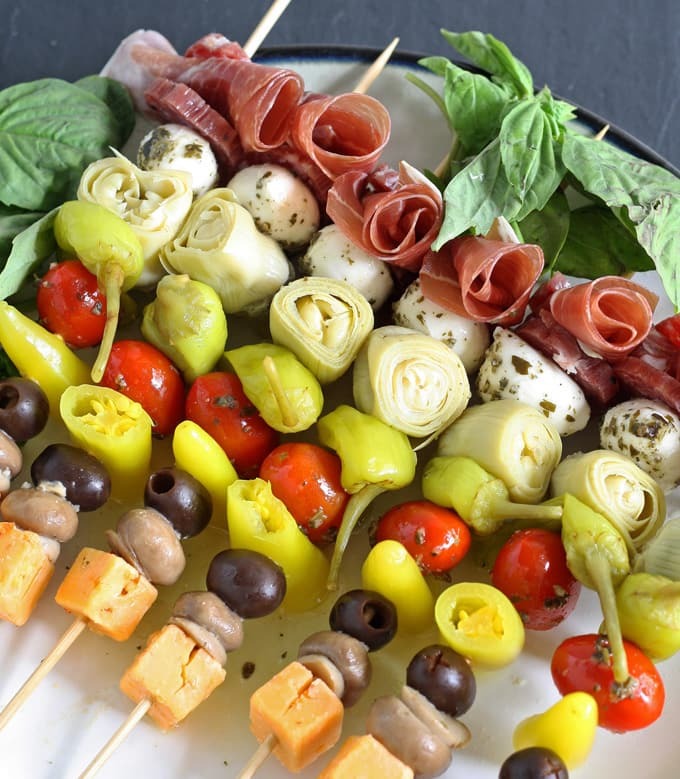 These antipasto skewers are GORG! I’m currently prepping for a camping weekend & think a batch of these must join us! These would be *perfect* for camping!! These skewers look like a terrific summer supper to me–I don’t even need to wait for the stuff on the grill, this will set me up just fine. I love the appetizer on a stick concept for a party! I can’t tell you how many times, while at a party, I am trying to juggle a cocktail, a plate of food and a fork to eat it with. These look great! Right? With only 2 hands, we need more food on skewers! I love your ANTIPASTO SKEWERS! I would make these and put them in the fridge and have them really cold. 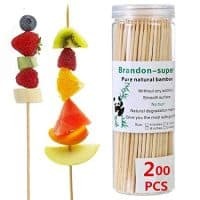 I like all the items on these skewers! Thank you Julie!! You’re totally right – they would be fabulous really cold! I love putting red pepper flakes on my grilled veggies. I love antipasto and would make your skewers for our next BBQ. What a great idea! I am totally going to do this at my next party! Found you on #TurnItUpTuesday. Come link up some of your recipes at my End of the Week Confessions Link-up! I like to add banana peppers to my Italian subs. Definitely making this for our next cookout! Thanks for linking up with What’s Cookin’ Wednesday! This looks like a wonderfully delicious and simple appetizer. I am featuring you this week, over at Simple Supper Tuesday. We hope you can join us again this week, starting Monday night at 8pm EST. I would #bringtheheat by making a veggie pizza on the outdoor grill. I love Mezzetta hot peppers! They are perfect from pizza, to cocktails, to subs and salads! I totally agree! I need to add them to a bloody mary soon! What a delicious idea. I love the way these look and could almost taste them; will definitely make this. To u #bringtheheat I’d add jalapenos to a sandwich. Oh my goodness- those skewers look delicious! I would #bringtheheat by trying out a few recipes such as Pepperoncini Shrimp Ceviche Stuffed Avocados. They look delicious! 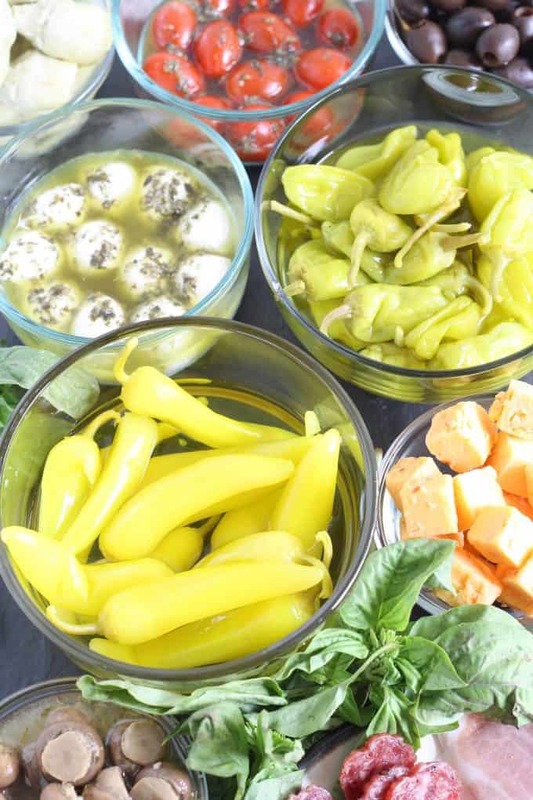 We love using the banana peppers on sandwhiches and subs!!! Will be trying these to #bringtheheat, they look so good! This would be fun for a potluck! Everything is always better on a stick. These are my favorite things to make! I love the artichoke and the peperoncini’s (a snacking stable in this house), I will have to try your recipe! Saw your post in FBC! Awesome Tina!! (I’m such a snacker!) Thanks for stopping by! Thanks for posting it there! Jalapeños wrapped in bacon, YUM! These look awesome! Everything I love on one skewer! What a great idea! Very creative. Can’t wait to make these for the next party. Yum! These are my kinds of appetizers. I love all things antipasto. All the tasty things! Thanks for posting. Hello from Weekly Wrap Up Linky. 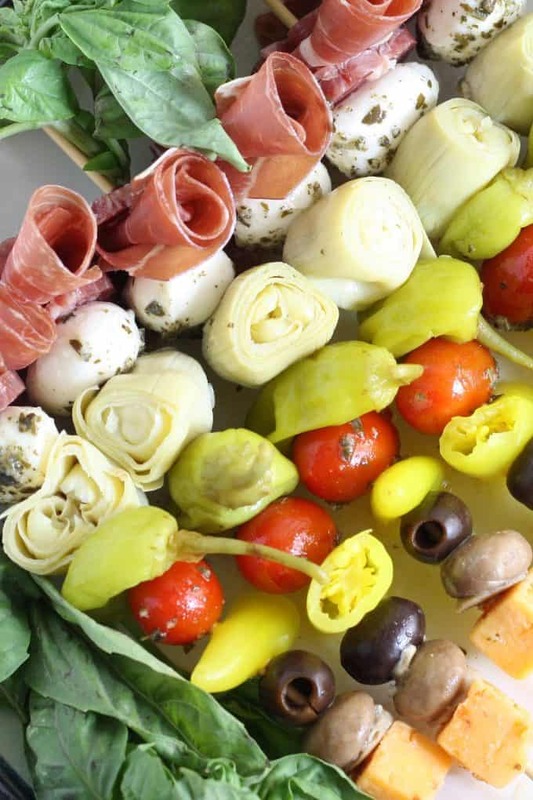 I do a version of antipasto skewers for all parties! Love an easy appetizer, and yours’ look gorgeous! LOOKS GREAT, LOVE YOUR QUICK RECIPES. CAN YOU TELL ME IF THE ARTICHOKE HEARTS ARE CANNED OR FROZEN & WHAT BRAND. These look great going to make them this weekend. Can they sit overnight? They can! Just cover them in the refrigerator. You also may want to keep some of the marinade from the tomatoes/mozzarella and drizzle that on top of those items before serving. How many days ahead of time can I make these??? You could make this 2 days ahead of time.